Symbian might be a burning platform, but it’s burning for over a year now and to get itself warm while it transitions to Windows Phone, Nokia announced that it’s adding the full Microsoft Office Mobile app to its latest handsets. This includes Word Mobile, PowerPoint Mobile and Excel Mobile, all ready to take the load off of your computer and on your cell phone. Nokia 808 PureView will also get it when it launches, while for the Nokia N8, Nokia E6 and Nokia 500 availability will be announed later. Word Mobile is fully functional on Symbian devices and promises to render all your tables and other fancy formatting right, and of course it supports document editing. Excel and PowerPoint also bring plenty of features, including formula editing for Excel and presentation editing in PowerPoint. The apps can be downloaded via the Nokia Software Update tool or through Nokia Suite after you connect the phone to your PC. 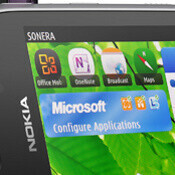 The applications join OneNote, Lync 2010, Document Connection and PowerPoint Broadcast, all of which were made available Nokia Symbian devices late last year. one day, nokia will take over microsoft's os as lone producer just like it did to symbian in previous decade..
err..that is very unlikely. Unlike symbian, microsoft is a BEHEMOTH. That's hard to believe. But who knows it could be other way round. What about s60 v3 devices? Any body knows how to download OneNote, Document Connection, and Powerpoint Broadcast? They don't appear on the Nokia Store in my N8.